We had a large number of irregulars from the last batch of James Black 3-Way Hats. I finally got around to sorting them out and putting them on the website. The flaw consists generally of a crooked seam at the very front of the hat; if that won't bother you, you can get a fine, versatile hat for only $18.50 (plus shipping, of course). There is also a small number of hats sized Small but marked medium, which I have personally corrected with a permanent marker pen; these are also on sale. Go to the irregular hats page if you want one. The city is gathering information for the Los Angeles Bicycle Master Plan Update. This is your chance to be heard by the folks who will decide on infrastructure and regulatory changes affecting transportational cycling in our city. 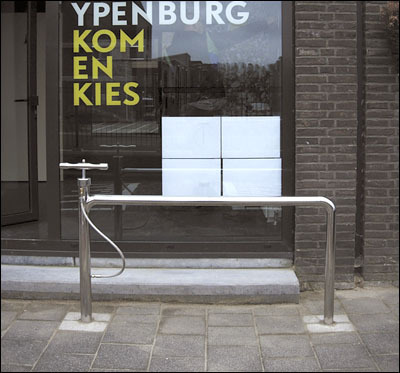 Yes, that's a bike parking rack with a working tire pump integrated into it! Superb idea, brought forth by Studio HiMom, who wished to "stimulate an interaction between neighbours while pumping up the tyres of their bicycles." So why live in Los Angeles if you're not going to ride to the beach? So I did--again--this makes probably five hundred times, I'm sure--and snapped a couple of nice photos, which I'll paste in here for your pleasure. 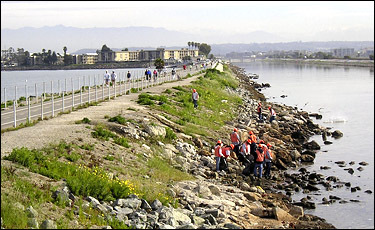 The folks in orange are probationers doing their community service cleaning up trash from the banks of Ballona Creek; you can see the bikepath along the causeway. This follows the creek all the way back to the east end of Culver City, only a few miles from where we live and work. Branches go up the coast to Malibu and down to Pacific Palisades, and it's a mighty nice place to ride--when the bubba with the gun ain't watchin' you. That being the view in the other direction, with the Pacific beyond, and my old Bottecchia in the way. 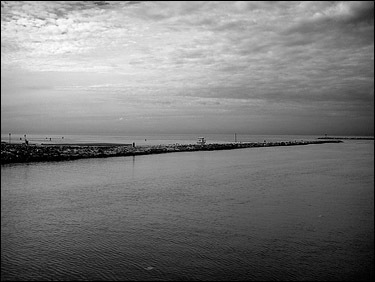 And the view to the southwest made me think of Holland, so I fiddled it a little in PhotoShop to make it moody and serene in the way the old Dutch engravers had--or as close to it as I could manage. 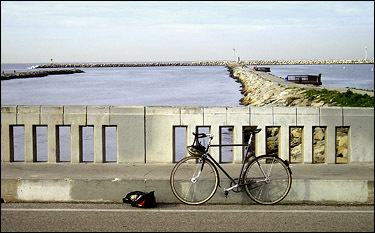 One of these days I'll write up a ride report on my longer beach ride, down to Redondo and back by various routes. It's a mighty nice way to spend a Saturday or Sunday morning in LA. In what may be a first in the cycling world, a former racer--seven-time Tour de France winner Lance Armstrong, of all folks--has opened a bike shop dedicated not to racing bikes, but to bicycle commuting! And in Texas, no less! ...commuter bikes, mountain bikes, triathlon bikes, fixed-gear bikes, low-riders, cruiser-style bikes and even hand-made "art bikes" that look as good hanging on a wall as they do rolling down the street. Stock will also include gear by Giro, Nike and Oakley. Showers and a locker room will allow commuters who don't have facilities at their offices to ride downtown, store their bikes at the shop, bathe and catch a ride on a pedicab or walk the rest of the way to work. The newspaper quoted Armstrong as saying that "he'd like to see Austin evolve into a place like Portland, Ore., where biking is part of the culture and people pedal to work, to restaurants and to run errands. 'Walk outside, and the streets are lined with bikes--because they have a safe place to ride'...."
Read more at the Austin American-Statesman website. There is no shortage of money for transportation in America, and there never has been. We have always spent big money on state-of-the-art roads and airports in America. The problem is we have been locked into a roads-cars-airports-only investment mode for more than 70 years, and now are stuck with systems that are beginning to fail, and because they are all dependent on oil, have a very bleak future. Read the entire article at TreeHugger.com. Read it all at: City's Two-Wheeled Transformation. The International Bicycle Fund, which promotes bicycling worldwide, has announced its Annual Student Bicycle Essay Contest. Although essays should be in English, students under age 17 from any country may enter. There's a small cash prize, and the greater prize of helping to advance bicycling in all its forms. The contest is divided into three age groups, so even grammar school kids can enter. So, if you're a student, or know a student, who has something to say about bicycling's place in the world, download the announcement (PDF), or simply to go the IBF's contest page for details. Yesterday, the cell phone rang, and it was a police officer calling to take a report on my very modest hit-and-run sideswiping of January 23rd. After I got home, I had written a letter to the captain of Central Traffic, expecting that their response would be the usual nothing. So I am happy to report that the LAPD did call back, and did take a report, and did say that detectives would call me "in a few weeks." If the driver had apologized, I wouldn't have bothered writing the letter. My shoulder was a bit sore for a week and a half, and I had a tiny cut on my ankle, and that was it. But she not only refused to apologize, but was indignant that I should expect her to! And the cops really don't like hit-and-run drivers. Of course there's no hard evidence, so nothing further is likely to happen. But when she does hit someone hard enough to hurt them or their vehicle--be it another car, or one of us or someone just trying to cross the street--her plate will be on record. It'll count. Sheldon Brown, know as "Captain Bike," resident maven of Harris Cyclery, died yesterday, apparently of a heart attack, following a struggle of several years with a rare form of Multiple Sclerosis. Sheldon was a passionate cyclist, photographer, musician, family man, and countless other persons all in one; he was a particular champion of fixed-gear riding, and greatly responsible, in my opinion, for its resurgence after decades of being the province of messengers, winter-training racers, and old codgers pottering about on England's byways. Sheldon also amassed possibly the greatest database of cycling technical and historical references on the Internet, housed in the warren of sites he maintained for himself and Harris Cyclery, and which included anecdotes, humor, rare photos, and more. Furthermore, Sheldon was immeasurably generous with his time and knowledge, answering phone calls and emails from sometimes hundreds of cyclists per day, while still working full-time at the bike shop. He and I met only by email a few times, but his humanity and kindness always shone through his words, even when his life must have been deeply discouraging. He was knowledgeable, generous, straightforward, a real mensch. Cycling is far the better for his having been with us. As many of you might know, I had been planning to ride Amtrak to Portland for the North American Handbuilt Bicycle Show. Unfortunately, Amtrak has cancelled the Starlight till at least Feb.15th, because of a mudslide on the Union Pacific tracks south of Eugene. Therefore, I am cancelling my trip. Walking with as light a footprint on the earth as possible is one of my primary goals, and the practice that we sell knickers and write articles to support. Flying causes over twice the carbon emissions per passenger/mile than even Amtrak's diesel trains, considerably more than even driving, so I'm going to walk my talk and stay home. Will be very sorry to miss seeing all my Portland pals, but maybe in summer, if sales hold up, Gina and I will take the Starlight up and just visit all our cycling pals there for a week or so. A two-track heavy rail line (such as a subway running at typical headways) has the passenger capacity of around 35 traffic lanes. Shinjuku, a rail/metro hub in Tokyo, logs 4,000,000 boardings per day, as opposed to LAX's 165,000. Shinjuku takes up about a city block and is surrounded by residences and business; LAX takes up 3,500 acres, and depresses property values for miles around it. Property values in every US city that has metro rail service go up around rail stations; values go down around freeway interchanges. Each affects a city's tax receipts accordingly. Freight trains are three to four times more fuel-efficient than trucks for moving the equivalent tonnage of goods or commodities, and use up vastly less land surface to do so. Even medium-speed passenger trains can replace all air travel for runs of up 500 to 700 miles, especially as they drop you off in the center of town rather than at a bleak airport on the outskirts; bullet trains (a mature technology now well over forty years old) can do so over much longer distances. Meanwhile, cars not only cost the earth (and our treasuries), but destroy culture--something they would do even if they ran on magic. You cannot build a viable culture upon a principle of personal isolation and public waste. Trains, like bicycles, are convivial as well as clean. We should be promoting them heavily. Think about that, along with everything else, when you vote next time. And every time.